The best cloud-based contact center technology exceeds your expectations. TCN aims to be that best provider with its free demos. These demos demonstrate the full platform, giving you a glimpse of what your communications and debt collections could look like long-term. To give you an idea of what to expect, here are seven platform features you can check out during a demo. Many organizations and businesses are understandably wary when it comes to predictive dialer software. When used incorrectly, it can lead to customer complaints and lawsuits. TCN’s Predictive Dialer software differs. It employs a number of safeguards to enhance TCPA compliance—without adversely affecting agents’ efficiency and productivity. Recording calls gives your company a historical document that can be used for quality assurance purposes. The record facilitates answers to customers’ questions, too. With it, agents can look to previous calls to understand issues and offer solutions, faster. Recorded calls can also stem complaints and litigation. TCN’s Call Recording feature fulfills the following purposes as well as one other: compliance. With TCN’s cloud-based contact center, you can easily pause recordings to protect customers’ identities and financial information. Some customers refuse to be assuaged by the first agent who answers the call. Solve for their frustration—and the agent’s—with Agent Transfer. If an agent ever encounters a difficult customer, he or she can transfer the call to another agent who’s better equipped to handle the situation. In addition, agent transfer allows customers to request a specific agent and speak with him or her almost immediately. TCN complements agent transfer with Manager Barge In. This feature keeps managers and supervisors aware of what’s happening in the call center. But TCN delivers more than mere awareness; the platform gives managers the ability to monitor and respond to situations in real time. When a call gets out of hand or an agent requires assistance, a manager can “barge in,” cementing agent and customer satisfaction. Whether your organization or business uses a virtual call center or onsite one, TCN helps both succeed with the Agent Gateway. The Gateway, an online dashboard, employs skills-based routing to ensure calls reach the best available agent. In addition, the Gateway assesses important metrics like first call resolution (FCR), response time, and schedule adherence. Your managers can use the Gateway’s reports to improve those metrics, as well as to impact business objectives. TCN’s integrated features are designed to enhance compliance efforts. In pursuit of that, TCN’s cloud-based contact center automatically scrubs cell phone numbers. The scrubbing decreases the likelihood of contacting customers who haven’t given express consent. The feature also helps prevent calls to people on the national Do Not Call registry. The above seven features are only the metaphorical icing on the cake. 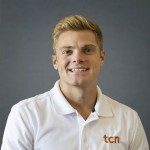 When you choose TCN, we work with you to build a contact center solution aligned with your business goals. To get started and to view the features for yourself, schedule a demo.